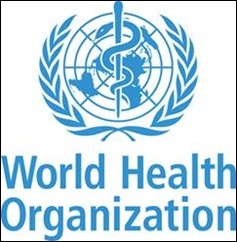 The World Health Organization (WHO) has released its draft strategy on global digital health. Their goal is to “improve health for everyone, everywhere by accelerating the adoption of appropriate digital health.” The strategy calls for a united approach to the awareness and understanding of the role of technology while tailoring solutions for each country. The strategy has two major components: the first outlines four strategic objectives while the second creates a four-part framework for action. WHO is accepting public comments through April 30. Since he works for a major health system, we also had a chance to discuss our thoughts on accountable care organizations and the shift towards value-based care. He wasn’t aware of recent survey data that shows that more than one-third of participants in the Medicare Shared Savings Program (MSSP) are considering leaving the program. Our friends in governmental organizations love renaming programs, but I’m not sure calling it “Pathways to Success” isn’t going to make it any more palatable for organizations that are concerned about their ability to take on higher levels of financial risk. This year’s survey data represented approximately 40 of the 200 ACOs. Those that are more likely to consider leaving the program included hospital-led ACOs, which have tended to perform below their physician-led ACO peers. We also had some good conversation around whether medicine is still a vocation or whether it’s becoming commoditized like many other industries. He’s no longer in clinical practice, and like many of our peers, attributes the decision to hang up his stethoscope to the moral injury that healthcare providers face on a daily basis. The reality of clinical informatics is that you don’t have to tell anyone that they have cancer and that their insurance won’t pay for treatment, or have to try to figure out how to help patients pay for their medications when they’re barely covering the rent. I think a string of practice and hospital mergers and acquisitions probably also contributed to his lack of zeal for the primary care trenches. He hasn’t lost his sense of humor, though, and one of the funniest comments of the day was about trying to address governance and adoption issues while his health system’s physicians are spending a great deal of innovative energy finding new ways to try to say no to technology. We discussed what it would look like if people spent that time learning and mastering a system or re-engineering their practices rather than just raging against the machine. The bottom line is that even across the country and with a different physician population, many of us are facing the same issues every day. Over the last several decades, the healthcare industry has been increasingly concerned about the role of government in healthcare, so I was excited to see an editorial in the Journal of the American Medical Association on “Building Trust Between the Government and Clinicians.” Co-authored by former CMS Administrator Donald Berwick, it notes that building such trust “requires understanding, empathy, and humility.” It encourages clinicians and policy-makers to walk the proverbial mile in the other’s shoes. The piece calls out several data points that are important – that the US spends nearly double what other similarly-developed nations spend on healthcare without significantly better outcomes or quality. It goes on to note that some policy makers focus on clinicians who put self-interest above the needs of our society, resulting in the creation of systems to “guard the public from them.” It uses the example of Medicare recovery audit contractors who are paid based on the number of issues they find, putting all physicians on the defensive when only a few are committing fraud. The authors note that “out-of-control oversight and policing for the 1% who warrant this type of scrutiny burdens the daily work of the 99% who do not.” I think most of us in the trenches would agree. In 20+ years in practice, I’ve never had a prior authorization request or precertification request denied, yet I have to continue to jump through hoops to order medically necessary tests. The editorial calls on clinicians and policy-makers to find common ground that supports both stewardship of resources and the patient care mission. This resonated with me. For policy-makers, achieving fewer and more efficient regulations would be more likely if they spent time understanding the position of the clinicians whom their policies affect. The realities clinicians actually face should provide a lens to view and judge new policies. Unless and until policy makers trust with their heads and feel in their hearts that the vast majority of physicians and other health professionals are well intentioned, they will continue to design policies around the exceptions rather than the rule. Policy-makers should regularly spend time visiting physicians’ offices and hospitals to better understand the ripple effects of policies on those providing care. It’s similar to having software engineers actually visit clinician practices using the systems they design and create, so that they’re not operating in a vacuum. I’d love to see them observe the folly that my staff had trying to get a CT scan approved after the fact (emergencies don’t occur during normal business hours) when the payer was pushing back because my documentation of the patient’s abdominal pain did not use the word “severe.” I finally asked if anyone at the plan had actually looked at the scan results. Had they done so and seen the enormous and life-threatening pancreatic tumor that was found, maybe they would have toned it down a notch. Instead, they were arguing over semantics. Perhaps they would have preferred to care for a catastrophic event when it eroded through a blood vessel rather than the controlled hospital admission we provided. They also call on clinicians to learn how the other half lives, understanding policy needs and learning about healthcare spending during medical school. In turn, “the vast majority of physicians who deserve to be trusted” would be rewarded with fast-track of pre-check systems like those used by the TSA. It remains to be seen whether legislators and other policy-makers will heed this advice, but we can be ever optimistic that perhaps someone will see through the money and special interests and give it a shot. I’m constantly re-engineering my home office and it’s easy for me to take a break because I can just wander to the sofa and put my feet up. Having spent entirely too much time in cubicles and small circulation-less conference rooms, I was intrigued by the idea of a nap desk. 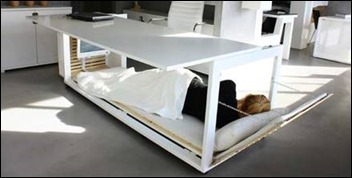 Naps are supposed to help improve mental awareness, but I’m not sure I would want to sack out under my desk even if it is made of stylish lacquered wood, metal, and leather. The desk is just a prototype for now, and unless you have your own office, I can’t imagine it would be terribly restful. What’s your strategy for catching a couple ZZ’s during the work day? Leave a comment or email me.